In March 2012 we all briefly went back in time to 1986, many of you joined us in celebrating the 25th anniversary of our first album INDISCREET at sell-out shows which were unashamed nostalgia-fests. 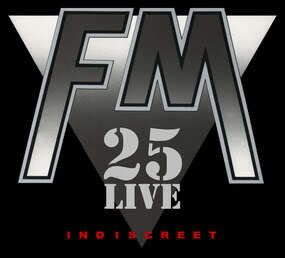 It gives us great pleasure to now bring you our new DVD - INDISCREET 25 LIVE. Filmed live at Manchester Academy 2 and London O2 Shepherd's Bush Empire this DVD also features a documentary section in which we reflect on Indiscreet's place in FM history. INDISCREET 25 LIVE is released via Riff City Films on 1st April 2013. The DVD will be available from the merchandise stand at our shows this March, and from release date at the FM webshop and all good DVD stockists.